CupCakes and CrabLegs: An Egg On Top...And Other Notes On Breakfast! 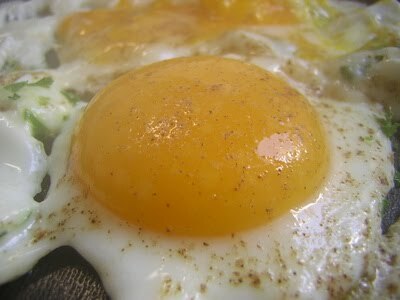 Throw a fried or poached egg on top of pasta or salad, and you have added a ton of protein and flavor to your recipe. I love a recipe for an Eggs Benedict Salad which is great for brunch along with Bloody Mary’s and some great bread. Bloody Mary’s – yep and so sorry, we make our own bloody mix from scratch. It makes a huge difference! Anyone wanting the recipe can email me. If I could only eat one meal a day, it would be breakfast. I LOVE BREAKFAST. Wake up early and cook up an inspired omelet with some great homemade bread on the side, fresh squeezed OJ, some fresh fruit and maybe a breakfast dessert – I know people who love eating bananas foster for breakfast. Wake up late, possibly because you were out until the early AM and maybe had a tad too much wine. We can fix that. Eggs – over easy, potatoes, steak, and a few good cups of strong coffee and possibly a table full of people who you happened to spend the night before with. Breakfast is one meal you can eat early – on the weekends only because during the week I eat a spoonful of peanut butter, a glass of slim fast and a banana – or eat late…then call it a brunch. Some of the best meals that I have created have been in the morning. A lot more recipes and talk about breakfast in coming posts and why it will continue to be the meal that helps me go strong all day. After doing a long run on the weekend, I love to have breakfast. My running partner Bonnie introduced me to both of these spots in Chicago and they have become favorites. The little pink house at 1381 West Hubbard is always crowded and has a sunny outdoor patio in season. It’s always a no brainer here for Steak and Eggs when recovering from and celebrating a race. Lots of other great breakfast foods and specialties including Eggs Florentine and Huevos Ranchero. At 1235 West Randolph, this place is equally as charming with great food including Heavenly Hots which are light, thin pancakes served with peaches, raspberries and blueberries and Ina's Home Made Granola with milk. She is also open for lunch and dinner and serves a lot of comfort foods such as chicken pot pie and southern fried chicken. Break eggs into ramekins or custard cups –usually over something like caramelized onions and croutons. Use your imagination. Since timing is everything, pull them from the oven before they have completely set as they will continue to cook for a minute or two after you have removed them. More on breakfast: I remember the first time Tommy cooked breakfast for me. The eggs were so great I asked him where he got the recipe. His answer: The Betty Crocker Cookbook!